Soaring prices and home loan curbs are forcing increasing numbers of buyers to turn to ever smaller homes as they struggle to get on the property ladder. The median size of private homes sold dropped to 947sqft in the period from July 2013 to June 2014, according to STProperty. This is slightly smaller than a HDB four-room flat, which is typically 969sqft. STProperty also found that 40% of units (both new and resale) sold over the past 12 months have been no bigger than 800sqft, which is the typical size of a one- or two-bedroom condominium unit. The 947sqft figure was 3.3% smaller than the median size of 979sqft in the first half of last year, before the TDSR was imposed. The effect of TDSR on home sizes was even more pronounced within the new sales market. The median floor area of new homes bought from developers in the past 12 months was just 753sqft, according to caveats lodged with the URA. That was 12.5% smaller than the median size of 861sqft in the first six months of last year before the TDSR was imposed. A run-up in property prices per sq ft (psf) since 2009 after the global financial crisis has also played a part in shrinking private home sizes. Non-landed home prices jumped 56.2% from 2Q 2009 to 3Q 2013, which was the peak. Coincidentally, the median size of private homes sold has been steadily declining since 2009 when the figure was 1,227sqft. “While the TDSR framework is working well to ease home prices, the shrinking home size is another area that the Government might closely monitor… There are certain social implications should small homes become a norm in Singapore,” said STProperty analyst Jason Chen. The subject has generated increasing sound-bites over the past few years. In fact, the wife and I had written a piece about “shrinking condo” back in April 2013. The STProperty and URA figures have helped to reaffirm the fact. In all fairness, Singaporeans still have it good compared to their counterparts in Hong Kong. From what we can gather over the Internet, as much as 90% of Hong Kongers live in homes that are less than 700sqft (% does seem a tad high, we must admit). And although the average size of homes is said to be about 500sqft, it is quite common to find families living in units that are between 200 - 300sqft. While larger apartments definitely exist in Hong Kong, this is typically out of reach for the average home buyers. 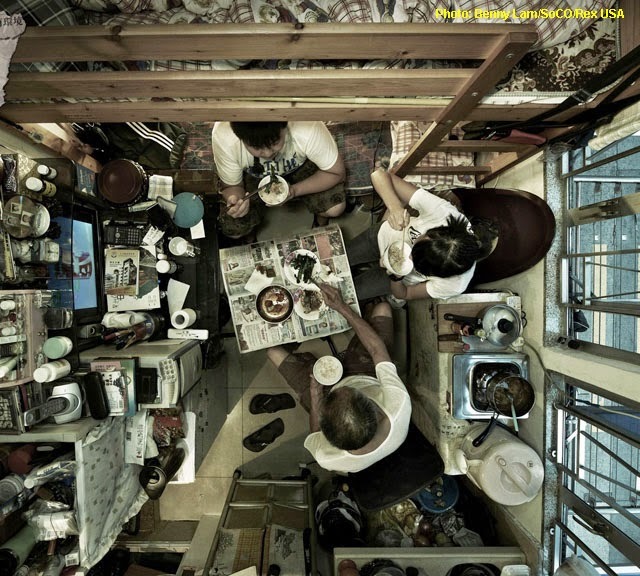 The average living space per person in Hong Kong is 132sqft – one of the smallest in the world and supposedly only half that of Singapore. Small flats have proven to be the most profitable use of land for private developers and the most efficient (highest land premium) for the Government in Hong Kong. But this has resulted in the territory having too many small flats and very few larger ones. The lack of quality affordable accommodation is often cited to be a critical factor in Hong Kong’s relatively low ranking in the annual Quality of Living Index by Mercer. Our friends from Hong Kong tell us that the reason why Tsim Sha Tsui and Causeway Bayare so crowded even at 9 or 10pm on weeknights is because many Hong Kongers feel so claustrophobic at home that they would rather stay out till as late as possible. So the home becomes a place they only go back to sleep in. Should Singaporeans allow the size of their private homes to decrease until we become another Hong Kong? Some may say that we are far from being there yet, but if the trend of "shrinking condos" continues unabated, whose to say that 3-bedroom apartment of 700sqft or less will not become a norm within the next couple of years? The wife and I feel that it is time to stop perpetuating the building of more small private homes and push up the average unit size. A suggestion is for our Government to specify larger units (e.g. minimum of 900sqft) as a condition in some of their future land sales. This may bring down prices (as developers no longer have the options of building primarily small units to try and prop up psf prices), which will entice existing home owners to sell their small apartments and trade up to larger ones. In turn, the increase in supply of the smaller second-hand private homes will make it more affordable for first-time buyers to become home owners too. Something for the relevant authorities to think about, maybe? No Comment to " "Case of the 缩水 (shrinking) condo" revisited "